Felix GregoryProviding a good impression whilst on a professional placement led to a full-time job for a Bangor University student before graduating. 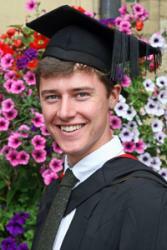 Not only will Felix Gregory, 22, from Liskeard, Cornwall graduate with a first class BSc degree in Forestry, he will also receive a Royal Forestry Society bursary for completing the best undergraduate forestry dissertation. Between his second and third year, Felix, a former Devonport High School for Boys, went on a professional placement at Pryor & Rickett Silviculture at their Brecon office. The company specialises in woodland management covering 50,000 acres from Buckinghamshire to Cornwall, and Wales and the Marches. The company manages properties which are remarkably diverse, ranging from tiny Sites of Special Scientific Interest to extensive plantations, and from small farm woodlands to whole estates. Many of the staff at Pryor & Rickett Silviculture are Bangor University Alumni, including the Managing Director, Graham Taylor MBE, who graduated with a forestry degree in 1990. Coming from a rural background, Felix has always wanted to work in the environmental sector and to contribute to the good management and guardianship of natural resources, so he’s “delighted to be able to do this”. Felix said: “The professional placement year was exciting and immensely valuable, and it enabled me to put what I’d learnt in lectures into practice and build on my skills in a professional environment. I made some great contacts and I’m extremely grateful that I was offered a job with the host company at the end of the placement.